The SUB T30.60 is available with or without amplifier module. This sub is a solid low bass specialist. 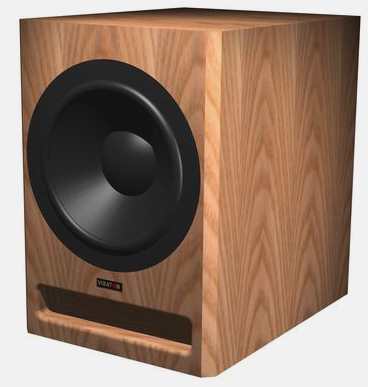 The somewhat smaller Sub T25.30 produces less bass and possesses less reserves; the Sub T25.50 produces more bass,but plays with less volume. The plan of the cabinet. 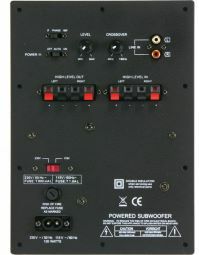 The subwoofer is available with different amplifier modules. If you are looking for a solid but not very expensive module we recommend Mivoc AM 80. Subwoofer module Mivoc AM 80 MK II is a module with gain control, cut-off frequency control and phase inversion switch. RCA sockets (to connect to pre-amp out) and binding posts (to connect to the main amp) are available. The satellites may be looped through the module. Required cut-out see description of the module. Upon request we also supply the Sub T30.60 with amplifier modules by Hypex or other manufacturers. Please enquire.